It’s no secret that there’s a crisis of community brewing. I expect that this crisis has been underway for as long as I’ve been alive, and it shows no signs of ending any time soon. Simply the time of Robert Putnam’s book Bowling Alone offers us a fairly succinct summation of our situation. It’s not just that we’re no longer joiners, but we’re finding it ever more difficult to create deep and abiding relationships with others. Although the church “should” be different, reality suggests that it isn’t. There have been any number of attempts at rectifying this reality, including the embrace of small group ministries, but have these been successful? Or, are they simply another attempt at developing church growth strategies? And even if successful at building relationships, have these attempts simply reinforced our tendency to join with those most like ourselves? That is, have our church-related small groups simply become social clubs of the like-minded, and thus part of the problem? Theresa Latini, a Presbyterian minister and Associate Professor of Congregational and Community Care Leadership at Luther Seminary in Minneapolis, seeks to address this crisis of community and the ways in which the church has sought to address it through the development of small groups. The book under review offers a rather exhaustive analysis of the crisis of community that has been burgeoning in our society. She also seeks to offer us a way of looking at small groups through a theological lens that will help correct some of the deficiencies present in the many small groups that exist in our local churches. She brings to this discussion a Reformed/Evangelical perspective that has been informed by her engagement with the theology of Karl Barth. This book is a revision of Latini’s Princeton Ph.D. dissertation in Practical Theology, and as such it is an academic treatise – much in the same vein as Tony Jones’ The Church Is Flat: The Relational Ecclesiology of the Emerging Church Movement (Jopa Productions, 2011). If you’re looking for a brief introduction to small group ministry or a how-to guide, this book is likely not what you’re looking for. It is written first and foremost for the academy, for theologically sophisticated readers. You don’t need a M.Div. to read it, but it wouldn’t hurt. There are a number of hints that this book emerged from a dissertation, that start with her explication of her mentor’s description of four tasks of practical theology (descriptive-empirical, interpretive, normative, and pragmatic) that one will go through in engaging ministry/ecclesial issues. Using Richard Osmer’s four tasks, she explores the way in which three practices interrelate -- Divine practice, ecclesial practice, and societal practice. In this context small groups are the ecclesial practice, which serves as the intersection where God’s work of reconciliation (Divine practice) encounters “the yearning for community in the United States (societal practice). Small groups have been developed to respond to the crisis of community, but the question is whether this has been an effective response. She undertakes this task informed by a Neo-Barthian practical theology. Having read her book along with Tony Jones’s, I’m assuming that the Princeton Ph.D. students in Practical Theology are asked to choose a theological vantage point upon which to build their work (Jones uses Moltmann). An epilogue to the book provides a rationale for this choice, while an appendix provides an introduction to her research methodology. The book begins with a discussion of the current crisis of community in society and then moves on to the role of small groups in responding to the crisis. She notes that the church has been the major source of small groups, which include Sunday school classes, bible studies, self-help groups, and special interest groups (e.g. political, advocacy, hobby, book discussion). Not only has the church been a major player in developing groups, but this move to small groups has altered the structure and even the meaning of our ecclesial practices. Christian education and pastoral care, to name two areas, have in many cases moved to small groups, with lay persons taking increased roles in leadership. There are both strengths and weaknesses in this move. For instance, she points out that while persons might develop a deeper sense of faith, that faith may become more subjective. They may re-embed social ties, enabling people to become more connected to community where these ties may not be very strong. There is another area, which is understandable, but worrisome – that is the tendency toward homogeneity in small groups. There is a tendency for these groups to strengthen ties among those of like-mind or background. Indeed, many, if not most, of these groups are rooted in some form of affinity, whether socio-economic, ethnicity, education, interests, gender, age – and there is a danger here that it undermines a sense of connection across more diverse lines. This reality also tends to lead to avoiding discussion of social issues. Part of her work in this project involved looking at specific small group programs, and she looked at six congregations (either Reformed or Presbyterian) to see how they organized their small groups. The six ranged in size from 250 to 12 persons and included both urban and suburban congregations. All of these congregations worked at providing leadership training and even created the materials for use in the groups – that is, these were for the most part highly structured contexts. This sociological analysis is brought together with Karl Barth’s understanding of koinonia, which Latini notes, includes not just fellowship, but such Barthian ideas as mutual indwelling, participation, coinherence, and coexistence. It is, she says, multi-dimensional, involving five interlocking relationships – within the Trinity, within the person of the incarnate Christ (divinity/humanity), between Christ and the Church, among church members, and between church and the world. The Holy Spirit serves as the “mediator of communion” in all five relationships, binding together each of these relationships. The question then becomes – how does this understanding of koinonia enable small groups to respond to the crisis of community. She suggests that her Barthian understanding of koinonia is expressed in three modes – gathering, upbuilding, and sending. As to the first mode, her focus is on the relationship with Christ, which is the foundation for koinonia. In the upbuilding mode, the focus is on the relationships within the church, and finally the sending mode looks to the koinonia with the world. The role of small groups in fostering the upbuilding relationships would seem self-evident, but what is key is the role that small groups can play in fostering koinonia with the world. Her hope is that small groups not only build community within the church but enable connections with the world, meaning that these groups need to have openness to those outside and see themselves as self-sufficient in themselves. As the book continues she explores the role that small groups play in creating contexts for healing and offers strategies for implementing small groups that can break out of the homogenizing tendencies of so many small group ministries. This is the pragmatic dimension of Osmer’s four tasks. When small groups nurture generosity, compassion, and openness to the world and find creative ways to witness to God’s love in both word and deed, they help the church fulfill its vocation of participating in Christ’s ongoing ministry of reconciliation unto koinonia. Furthermore, when small groups practice multidimensional koinonia, they participate in God’s transformation of the crisis of community in late modernity (p. 180). In other words, small group ministry is not simply an end in itself with the goal to making the church grow. It is instead a key means through which God engages in transforming the world. For those of us who are exploring the call to be missional, this is a helpful and hopeful resource. If you’re looking for a quick reading introduction to small group ministry or a how-to manual, you’ll likely want to look elsewhere. This is not light reading and it’s not a how-to manual. 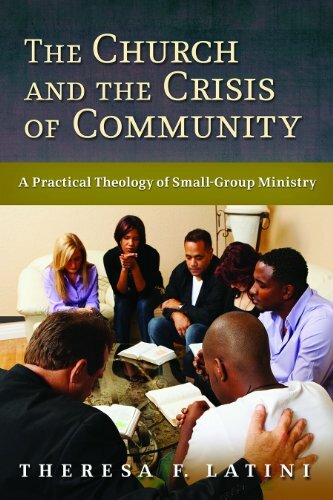 It does offer some strategies for developing small group ministries, but the focus here is on developing a sound theological rationale for small group ministries that will address the crisis of community existing in the United States. It is a reminder that the tendency for small groups to become gatherings of like-minded folks so as to reinforce their like-mindedness is not the Divine intention. With this trinity of modes of existence -- Gathering/Upbuilding/Sending – reflecting the koinonia that exists within the Trinity that is God, we are invited to join with God in the work of transformation. In developing this theology, Latini notes that Barth’s focus on divine action needn’t preclude human participation. As to the role that Barth’s theology plays in this book, one needn’t be a full-fledged Barthian to make sense of the book or embrace its insights. She does a nice job of laying out principles that can be accessed from a number of theological vantage points, but Barth’s Trinitarian perspective offers a helpful foundation for her ideas. So, if you’re looking for a resource that will help you develop a solid theological foundation for small group ministry, that seeks to move us away from subjective interiorism toward an engagement with the world, then this book might be what you’re looking for. If you’re interested in developing a small group ministry that will keep small groups connected with the broader congregation, support its mission, have a theological foundation, impact the world outside the church, and embrace the kinds of diversity present in the world, then Latini’s book will be of interest and value. Just remember that it began life as a doctoral dissertation and thus some of the trimmings of such an endeavor remain present in the book. If you take this into consideration you will find a very thoughtful and useful expression of a practical theology that is truly practical, missional, and needed at this moment in time.